I liked this novel quite well, but I am not prepared to articulate why. Usually when I feel that inarticulateness I don't bother to write a review at all, but this time I do feel compelled to say something about genre classification. I prefer science fiction over fantasy, but if you look at my bookshelf you will see that I am not exactly opposed to fantasy either. Even though there might be some overlap, just like you might have a western that is also a mystery, the two genres have little to do with each other. It is an artifact of the history of publishing, though, that science fiction and fantasy got lumped together and it is an artifact of that lumping that fans of one tend to be fans of, or at least read, the other. It is also an artifact of that lumping that science fiction authors often write fantasy too. 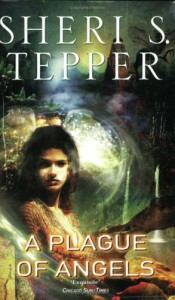 Sheri S. Tepper is one author who, even though I have not followed her closely, I have never known to write fantasy. So I came across the synopsis for this book and noticed the references to dragons and ogres. I was a bit surprised to find a Sheri S. Tepper fantasy, so I decided to try it out. Well, it was not fantasy. It was science fiction. How, you may ask, can it be science fiction if it has dragons and ogres in it. There are even some trolls and talking animals, by the way. Well, think genetic engineering.